Hello Everyone, I am back with more Pretty Pink Posh goodness. share it with you today. For this card I also use the Lawn Fawn Snow Day stamp set and Snow Day lawn cuts. I first adhered the yellow striped of patterned paper on the white card base. Next I cut the white card stock panel a little smaller than the A2 card and mask the bottom to create the grass look. Next I die-cut the center using the Peek-A-Boo die. The two bunnies were stamped, colored, and die-cut from the Snow Day stamp set. 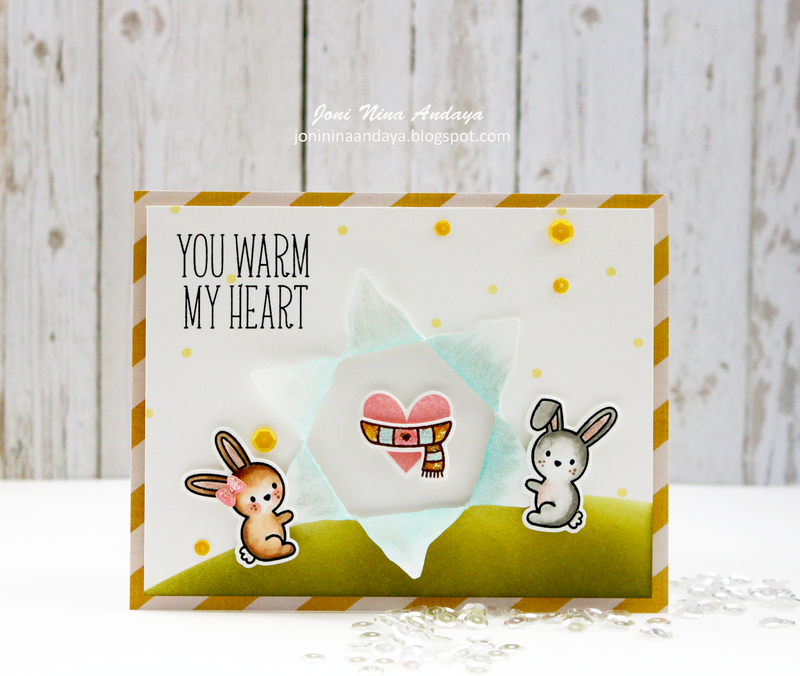 They are perfect to hold the sides of the Peek-A-Boo die to reveal the heart image that's also been die-cut from the same Snow Day stamp set. The sentiment and the tiny dots is also from the Snow Day stamp set. I added some Marigold sequins in 6mm and 4mm to finish off this card. OMG!! 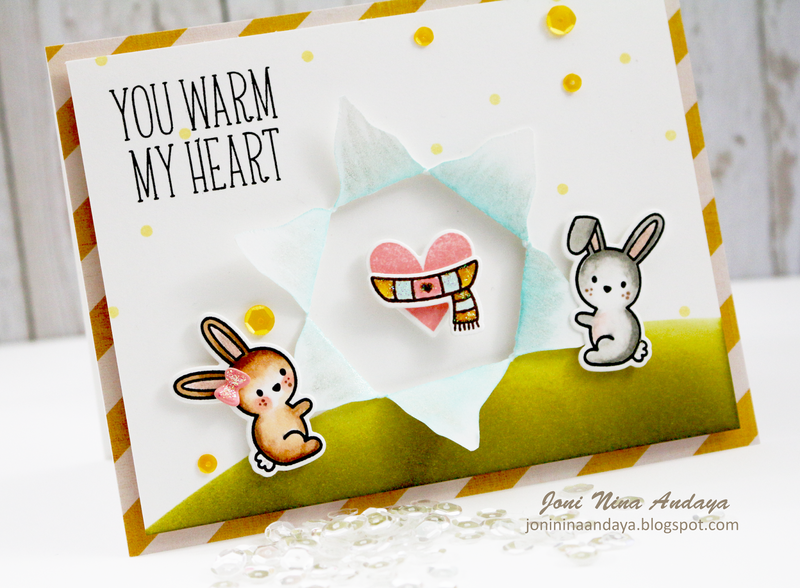 ..This is so adorable ..Love your card Joni ..Its beautiful !! Such an adorable card, Joni! This is fantastic! Love this scene, Love the use of the die as the focal point! Love the sprinkled sequins mixed in with the flicked ink! This is just fantastic! So cute!!! Love how the bunnies are holding the paper open!!! So adorable Joni. I love how each of the bunnies are holding a part of the die open. Sweet card. Love your use of the product and designs. What a darling scene you created, such a sweet card! Oh Joni, this is beyond sweet. soooo cute and adorable and sweet great ideas! Joni, your card is absolutely ADORABLE! This is adorable Joni! i like the color you added to the inside of the Peek a Boo die! So cute!! Love the die! Joni,this is the most cutest card!! Beautiful job!!! Such a sweet card. Thank you for sharing. This is so cute, Joni!!!! I love how the bunnies held the sides of opening! Gorgeous inking as usual! !